There are many scientific theory behind the perfect wake-up call – elements of which have trickled into many of the Google Play Store’s alarm-based titles. 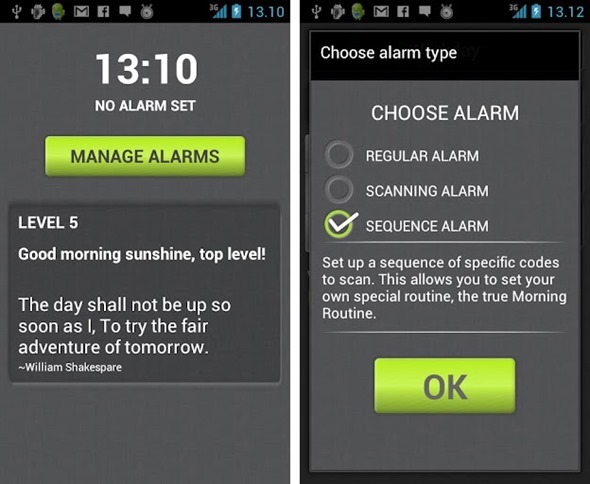 Despite Google’s recently re-branded app farm already housing many different wake-up utilities all boasting a certain quirk or element of uniqueness, Agens AS has decided to have another crack with his currently free Morning Routine app. To be honest, this is one of the funniest (and theoretically marvelous) apps we’ve ever come across. The problem with an alarm is that you can easily switch it off or activate snooze, falling back to sleep and defeating the initial object. This app, however, can be set up so you have to scan the milk carton, or any other item of your choosing, in order to deactivate the alarm. 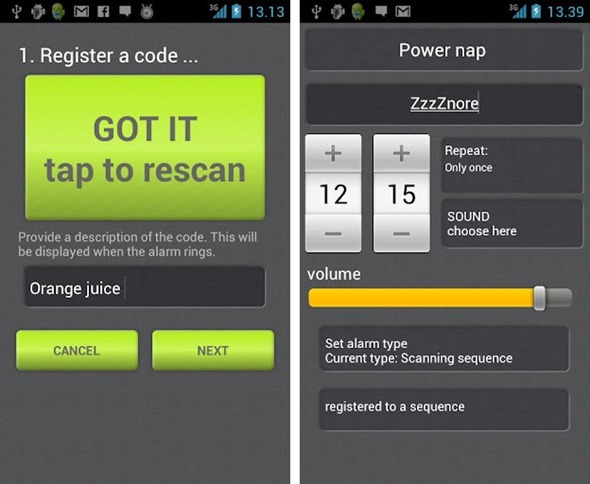 It uses zxing’s barcode scanner to scan barcodes, meaning that unless you’ve taken that milk carton to bed with you, there’s no way you can languish and fester in your bed for a minute longer. It’s not the first time we’ve seen such exaggerated wake-up methods implemented to help the chronically lazy, either. MathAlarm for iOS requires the user to resolve a fairly basic math problem in order to cease the irritating buzz of the alarm. The barcode scanning feature is not mandatory – you can customize it to begin playing your favorite radio channel, or even open your favorite web page once you’ve managed to claw your way from bed. We want to offer you the best morning routine. Get the app for free, and pay us by giving feedback on how we can improve the app. What a beautiful sentiment, indeed. You can download (and leave feedback for) Morning Routine by visiting the following Google Play link. It will become paid once again in the near future, so don’t wait around if you’re lackadaisical in the morning. Please note, you device may not be compatible, so as usual, check the comments section of the Play Store page. Don’t blame us if it doesn’t work on your device, we’ve warned your beforehand.